"Come Back in One Piece"
(2000) "Come Back in One Piece"
(2000) "We Need a Resolution"
"Come Back in One Piece" is the third official single from the Romeo Must Die soundtrack. 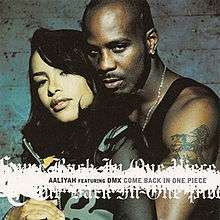 The song was performed by Aaliyah and features a guest appearance by DMX. The song was not a Top 40 hit single in the U.S., though it was a minor urban contemporary hit. In Europe, "Come Back in One Piece" and "I Don't Wanna" were released together as double A-side single. The single was not successful on the U.S. Billboard Hot 100, but reached the top 40 on U.S. R&B charts. The song sampled "Sir Nose D'Voidoffunk" by Parliament, from their 1977 LP Funkentelechy Vs. the Placebo Syndrome. The same song was sampled by N.W.A. in 1991 for their song "Niggaz 4 Life" from the album of the same name. No uncensored version of the song is available very easily, as the album which it appeared on censored all profanities (unusual since the film which it served as a soundtrack to had a lot of profanities, and was rated R). Also, Aaliyah's discography in general has been free of explicit lyrics. All profanities were replaced with typical ad libs from DMX songs, such as "what?" and "come on!". The US promotional CD single features the explicit version of the song. The video was filmed in Yonkers, New York. The video features Aaliyah and DMX in an urban setting. At the beginning the two pose for pictures against a brick wall, with Aaliyah mouthing DMX's opening intro. DMX appears at a convenience store fighting other men. Aaliyah appears in three scenes singing. In one she is laying on a bed with her dog, another walking down a sidewalk with a pit bull, and the other with her sitting beside DMX. In between cuts, the scene shifts to children sitting beside televisions with scenes from Romeo Must Die. At the end children and adults alike, stand in front of murals of Aaliyah and DMX. The Video landed at #10 on BET: Notarized Top 100 Videos of 2000. The video was directed by Little X. "Age Ain't Nothing but a Number"
"If Your Girl Only Knew"
"Got to Give It Up"
"The One I Gave My Heart To"
"Don't Know What to Tell Ya"
"Live and Die for Hip Hop"
"Summer Bunnies (Summer Bunnies Contest Extended Remix)"
"Your Body's Callin' (His & Hers Extended Remix)"
"No One Knows How to Love Me Quite Like You Do"
"X Gon' Give It to Ya"
"Get It on the Floor"
"Lord Give Me a Sign"